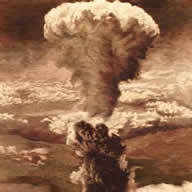 It was seventy years ago that human beings were first targeted with - and annihilated by - an atomic bomb. The August 6, 1945 decimation of Hiroshima along with the immediate and long-lasting sufferings of those living in and around that city have been well chronicled. Over 3,500 books have taken up the bombing of Hiroshima. That bombing has been discussed and debated in over 750 law journal articles. And yet, nuclear warfare - or a unilateral nuclear attack - seems more and more likely: from Iran, from North Korea, from armaments being moved to Ukrainian borders, and even from ISOL. As to Iran's "suspect secret nuclear weapons programs," indications of North Korean, Chinese, and Russian complicity (and financial opportunism) have not radiated high-level alarm at the United Nations. In the U.S., no appreciable alarm has been registered against those who would move NATO (the U. S.) to the nuclear brink on behalf of illegitimate and reckless factions in Kiev. At this 70th anniversary, it would be a most fitting memorial for world leaders to steep themselves in accounts of the first atomic devastation. The Hiroshima bomb killed in many ways. There were those who were vaporized immediately in the explosion. There were those who died from radiation burns or in the sheets of fierce fire that consumed whole blocks. Many thousands became perishable (and perished) because so many doctors and nurses and would-be rescue workers were killed or severely maimed. Medical supplies were obliterated and hospital equipment destroyed. The few surviving clinical facilities were overwhelmed with critical cases. •	"faces almost blotted out by flash burns"
•	"faces wholly burned; eye sockets hollow, with fluid from melted eyes running down what was left of cheeks"
•	"skin that slipped off in huge glove-like pieces"
•	"bleeding that could not be stopped"
•	"mouths so swollen that even a makeshift straw couldn't be admitted"
A 21st century nuclear carnage would pose contentious ethical, humanitarian, global ecological, "cost-benefit" and logistical calculations, in addition to purely medical exigencies and quandaries. Who could blame rescue workers and healthcare professionals who try to save their own family members, other loved ones, close friends, long-time neighbors. 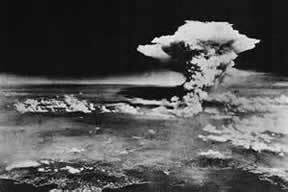 In Hiroshima, John Hersey noted that even those who had been trained to deal with death and the dying "were staggered by so much raw flesh" - and were "dazed, overwhelmed, and unable to comprehend the wider circle of misery." In a depleted and drained voice, a doctor recalled for Hersey his having to ignore impassioned pleas for him to leave what remained of his hospital to go to the aid of those exposed and expiring on a riverbank. The effort-outcome analysis had become all too stark: The doctor explained, "There was no hope whatsoever for most of them." How soon after the next atomic blast will teams of doctors and nurses be able to function in the irradiated sector, with the necessary supplies and equipment? How will survivor predicaments be prioritized? For public health reasons, corpses and human remains will have to be cremated almost immediately. Will it be feasible to identify remains and record the dispositions in ways that will provide some comfort to survivors who would already be suffering emotional and psychological harms? In frightfully dire circumstances, who will attend to the physical, physiological, and biological consequences of a nuclear explosion? Who will supply all the blood for transfusions and the antibiotics? Who will check the air, the water, the soils and livestock? Who will test food supplies? Has science advanced to deal adequately with the long-term consequences of radiation - leukemia and other cancers, endocrine disorders, anemia, rheumatoid issues, wounds that do not heal, unyielding infections, chromosomal aberrations, and gene mutations? There are still other "sicknesses" that accompany such devastation: In Hiroshima, John Hersey chronicled pervasive hunger, shortages, exploitation, disorder, black markets, crime.... What might be done to ameliorate such ills? and by whom? The U. S. Congress has not been especially forthcoming with funds to aid those whose health has been compromised as a consequence of rescue and recovery work at the September 11, 2001 "ground zero." Will Congress rise to the occasion if Iran's uranium-enrichment installations at Natanz and Fordow go full tilt? if Iran's uranium-conversion facility at Isfahan remains fully operational? if Iran's heavy-water nuclear reactor at Arak continues to hum away? Will Congress and the Administration turn attention to and provide support for the considerable elements in Iran that oppose the Ayatollah and the regime bent on aggression? Immediately following the Hiroshima and Nagasaki devastations, and for years thereafter, many American organizations and individuals, as well as the U. S. government and military, provided medical and humanitarian aid. There are those who contend it was not enough. But would North Korea, Iran, or ISOL make any effort to relieve the suffering caused by their nuclear projections? For seventy years, significant voices in the U. S. have debated the use of the atomic bomb to end the war in the Pacific. Would there be any such debate, let alone remorse or guilt, in North Korea, in Iran, in ISOL? As to aggressors who persist in enriching uranium and plutonium to weapons-grade, who are developing advanced centrifuges and delivery systems, who are intriguing to buy, beg, borrow, or steal such - what can be done, without starting a war? Is there any effective recourse if efforts at monitoring and surveillance are thwarted by interdiction and layers of concrete? If efforts to inspect and verify are delayed and then resolutely-restricted, how readily might a full-fledged "snapback" of truly enforceable sanctions be devised and imposed? Well before it may seem conceivable to consider Senator John McCain's 2007 presidential campaign quip "Bah, bah bah, bomb, bomb Iran!" (a lift from the Beach Boys' "Barbara Ann"), the world of the concerned would have to begin to imagine truly crippling (and well-focused) sanctions that might actually defund the fueling of Iran's nuclear and ICBM ambitions, along with its support of terrorism. If a wealthy uncle (an Uncle Sam, say) was trying to curb the reckless and dishonest ways of a villainous nephew, would the uncle hand over wads of hundred-dollar bills to the nephew? What if the nephew had already been charged with numerous counts of aggravated assault and battery, and conspiring to commit murder? Assuming that after a plea deal, the nephew promised to be good, to refrain from mass murder and other mayhem, would that promise alone inspire the uncle to fork over millions of dollars. Shouldn't the uncle wait a few years, or a few months anyway, to see if the nephew has reformed and is good to his word. Wouldn't it make more sense for the well-meaning well-intentioned uncle to test the nephew by giving him gift certificates and a debit card that could only be used to buy food and medicine, and to pay for doctors' visits and health care? oh, and maybe some career-counseling? 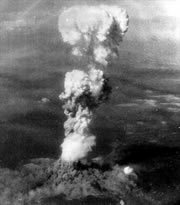 The 70th anniversary of the Hiroshima bomb should have world leaders imagine thousands and thousands of gallons of nuclearized gasoline being dropped on a city, ignited by thousands of blow torches, with the flames and whirlwinds spreading lethal radiation hundreds of miles in every direction. Regardless of how one views the arguments for the bombing of Hiroshima, John Hersey's 1946 chronicle provides searing evidence of what befell those who were targeted by 1945 science and technology. A Pacific, and pacific, connection to a novelist's projections? In furnishing On the Beach with as much authentic science and technology as the 1957 novel could transport comfortably, Nevil Shute studied nuclear physicist Ernest Titterton's Facing the Atomic Future, published in 1956. Nevil Shute was an aeronautical engineer who in the 1930s helped develop mechanisms for retractable landing gears and in-flight refueling. From 1940 to 1944, he served as a British naval officer in the Admiralty's Department of Miscellaneous Weapons Development. There he researched, designed, and supervised the building of prototypes for the detection of approaching aircraft. He devised "stills" that could distill fresh water from sea water via evaporation, and could recover and filter water from engine exhaust gases. He also developed designs for rocket-propelled pilotless gliders to be deployed in defensive actions, which, in retrospect, would seem to be forerunners of what we know about Iron Dome. No matter that the novel's inexorable and completely devastating technological and meteorological tellings have been questioned by some modern-era scientists. Shute's 1957 imagination of the ultimate nuclear nightmare (1961 - 1963) should encourage responsible parties to get past rhetoric, dismissive assurances, and wishful thinking. After all, the Cuban missile crisis of 1962 was all too real. Biographer John C. Anderson (Parallel Motion: A Biography of Nevil Shute Norway) has noted that just after the Normandy invasion, William Penney, one of Shute's closest colleagues, joined the Manhattan Project, at Los Alamos, to work with Robert Oppenheimer (who became known as "the father of the atomic bomb"). Anderson speculates that this British mathematician and physicist shared, with Shute, Oppenheimer's subsequent regrets about the arms race that the Hiroshima bomb had unleashed. Also shared were data about the radioactive fallout from nuclear testing. Oppenheimer forecasted that atomic bombs would become "very cheap" and "would not break the economic back of any people that want nuclear armament." He warned that as "weapons of terror" they "would actually weaken, rather than strengthen, the U. S. military and international position." He predicted that "future (cheap) bombs would be terribly more terrible" and "a weapon of choice for aggressors." Oppenheimer's warnings caused him to fall out of political and military favor. Even so, perhaps even more so, those concerns seem to have found their way into On the Beach, as Nevil Shute's cynical scientist (Shute's alter ego) explains, "The damn things got too cheap." The scientist goes on to rue that containment wasn't possible because of the identification and communication errors - and irrationality - of "the little countries - the Irresponsibles." Apocalypses now and then: computer-generated-imagery versus the fallout from literary visions of nuclear fission: On the Beach, and Iran on the brink. The working title for On the Beach was "The Last Year." As Congress, and the world, study the terms of the deal to restrict Iran's nuclear program in exchange for sanctions relief (the "Joint Comprehensive Plan of Action"), it can be hoped that 2015 will not have provided the trajectory to another Hiroshima. John Hersey's portrayals should burn in the memories of all "responsibles."